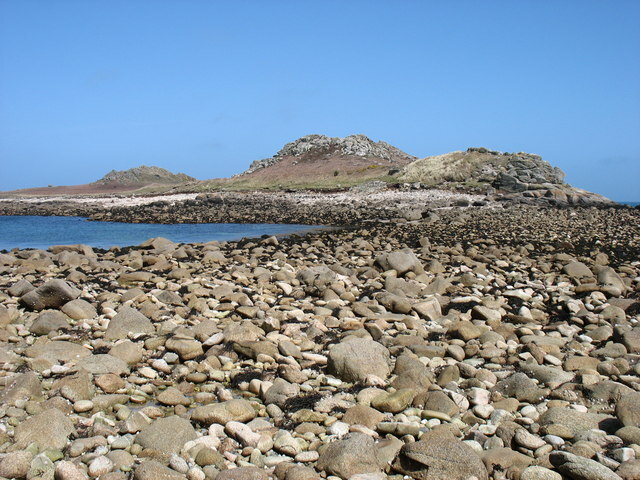 At high tide, White Island is cut off from St Martin's (see SV9416 : St Martin's Head), but at low tide it can be reached by crossing the 'White Island Bar', seen in the foreground here. However, while most bars in the Isles of Scilly are sandy, this one is made up of boulders of varying sizes. I decided that the risk of a twisted ankle, or worse, was too great, and so I did not actually visit White Island as I had hoped to do. Fortunately from the Geograph point of view, this did not cost me any squares!